Anyone else get a ton of them Jan 5? Not sure it's just the normal amount, but I noticed my paltry Adj. return bumped up .1% to 3.46% which was pleasing and seemed more substantial than in the past. I have not been investing much for about 1 year. 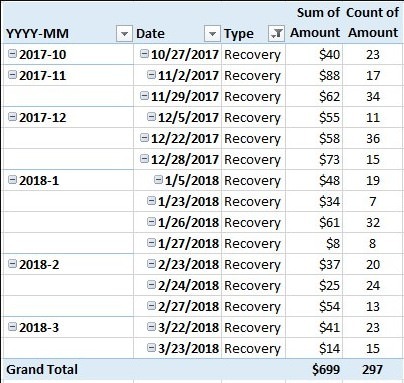 Re: Recoveries: More than usual? My adj annualized returns is hovering around 1.8%. Very low but it was lower than that last month. Typically end of year is a bad time for loans as a lot of folks don't have as much funds to make payments. Could be also that collection centers are being staffed up again now that vacations are over. Thanks for pointing this out. I discovered Dec. had $48 recovery and Nov. had $24, up from $2 in Oct. That's a trend I like! Didn't have an adj. val jump, but that's because of sales' discounts. Yes, I also got an unusually large cluster of Recovery payments and fees on 1/5. Recoveries two days in a rows. Maybe on the 26th and/or 27th too based on Jan or Feb data. Decided to practive my Pivot Table skills and downloaded a few months worth of data breaking down by month and then by dates within the month. I've noticed quite a few recoveries in the past 4 out of 5 days. I was thinking of making another pivot table. Have I lost it or did LC take away the ability to download your transactions (activities)? Perhaps there is a special download URL or in their revamping the site a few times they decided it was not necessary. UPDATE: I just did a crude cut-n-past, change-all-in-notepad ... to create the below. Yea. Looks like they redid the activity page and there is no ability to download. What's even worse... there's no ability to even SEE all the transactions! All the payments for a day show up as a single total, and when you click on the total, a window pops up showing the note by note detail. For me, that popup window is larger than my screen, and it has NO SCROLL BAR, and no way to download, so there's no way to ever see the numbers. For several years this page has been screwed up, providing no way to reconcile the data (ie like balancing your check book), but now you can't even see the numbers, so there's no way to do anything. Its worthless. FYI, I can use the mouse scroll wheel to move down but I can not use the page scroll bar or that popup dialog box goes away. Crazy they design this stuff with one person or something. NOTE: For the heck of it I cut-n-paste those transactions; then paste into notepad; change all $ to <tab>$; the cut-n-paste those into a spreadsheet. Example below. Just for the heck of it so see what some transactions are doing (pay off, pay late, collections, etc). I built a URL in the Google sheet that I can then go look at that loan. Based on my column names you can see I sort by a couple columns. Obviously, I added the columns on the right (following '.' column) to break the IDs up so I could build the URL. Cut-n-pasting scrunched them all together Automatic 'Conditional Formatting' also made numbers stand out.